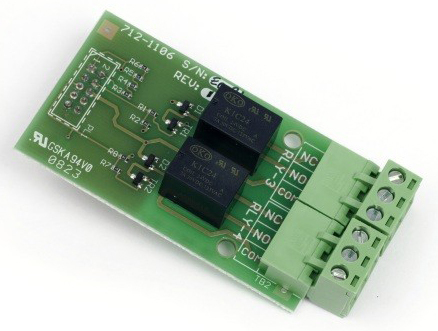 The 2-Way Programmable Relay Card 2-Way Relay Output Card is an internal peripheral for use with MxPro 5 series control panels. This additional PCB provides a cost effective solution to providing 2 individually programmable 1 Amp rated, volt free, change over contacts. The 2-Way Programmable Relay Card connects directly to the panel’s motherboard in which each output can be individually assigned to an output group to provide full support for dynamic zoning. 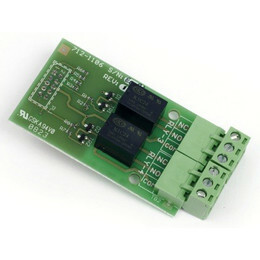 Ideal for any application where a number of programmable outputs are required at the panel, e.g. landlord/tenant interfaces. The system can to be easily configured to provide additional outputs for the more complex cause and effect configurations using standard products. Cost effective against ancillary hardware. Each output 30V AC/DC, 1 Amp rating. Each output can be assigned to an individual output group and is fully programmable for any output function allowed within the Mx configuration programme. Only one 2 Way Relay O/P Card can be fitted to MxPro 5 Series Fire Panels providing a total of 4 programmable relays per panel.